Steph is a music and performing arts manager at an FE college. She was diagnosed with MS in 2008. 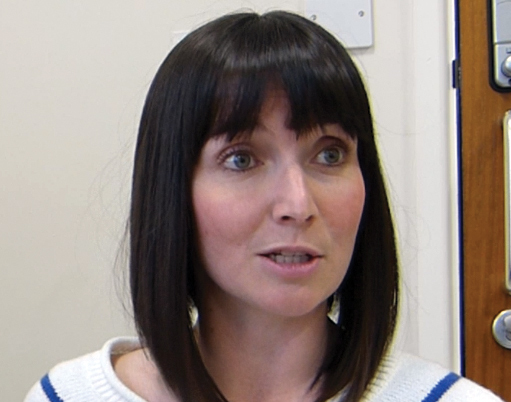 Here she talks about how Gilly Burdon, an MS specialist occupational therapist, helped her. Steph: I had a baby 18 months ago. I’d had a really tough pregnancy. I had a back problem which stems from an MS-related foot issue, so I was in a lot of pain. Then after I had my son, I had an MS exacerbation. Del my MS nurse could see I was struggling and that’s when she referred me to Gilly... Gilly had just returned from maternity leave herself and that was really reassuring: speaking to someone who had a baby and also understood MS. Gilly made loads of recommendations about how I could manage better day to day around the house. Gilly: One thing Steph was struggling with was fatigue. So we did some fatigue management. Steph was perfect: she took all my advice and implemented it! And it made a real difference. Steph: I used to do yoga and pilates, but the big thing Gilly talked about was rest. I was like, “What do you mean? I do nothing all day! My husband goes to work and I sit with the baby. I rest all day!”. Gilly explained that resting was actually about shutting down and closing my eyes and stopping thinking about the baby and everything else. I thought, OK, that sounds like meditiation. I had an app on my phone and I really started to use it. To start with I was doing three 20 minute meditations every day. Within a week, two weeks I had seen a massive improvement. It felt like I was taking control. I didn’t have a clue before. It really did smack me in the face, the fatigue. It was that overwhelming. Never mind having a baby. I didnt know how to manage it. Gilly: Having a baby is tiring for everybody – but putting MS in the mix as well can be really debilitating. All you want is to be a good mum but the fatigue isn’t allowing you. But Steph got some really good strategies up and running. As an OT, I think sometimes it’s about giving people permission. They need to hear that it’s OK to sit down and have a 20 minute rest and not feel guilty. Steph: I use meditation all the time. I’m now back at work three days a week, and Gilly has been a great help managing that return. I’m at home with the baby two days a week. On those two days, whenever the baby is sleeping, I’ll be meditating. The MS Trust publishes guides to managing many common MS symptoms, including fatigue. To find out if an occupational therapist could help you, speak to your MS nurse or GP. Use our Map of MS services to find out what's available near you.